I believe that this is what my sister would do if she had eight legs. I’m having to adjust my humor levels accordingly to my sons. Given that Toph is in kindergarten and not second grade like big brother Andrew, his sense of humor is not as refined. Accordingly, when I started drawing, I began with something completely different. Then I remembered that Toph’s idea of “funniest doodle ever” is a dinosaur with a person in a sandwich. 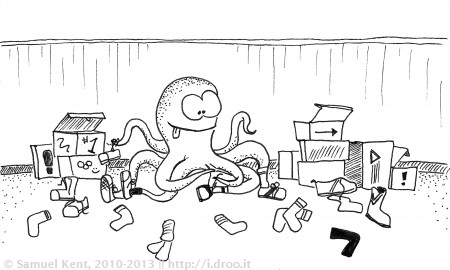 So, octopus wearing lots of socks and shoes? Funny to a five-year-old. That octopus looks familiar! Great work!